The state of online travel exploration and discovery is very, very poor. Most sites seem to be either a link farm or a black hole of useful, but impenetrable links. I don’t know about you, but to me, researching potential trips seems like it should be a visual experience as much as anything else. And the best recommendations often come from people you trust — your friends. So why doesn’t the online process of preparing to travel incorporate these elements? Travis Katz wondered the same thing. That’s exactly why Katz (a former MySpace executive) started Gogobot, a service launching today in closed beta. “I love traveling, I’m passionate about it,” Katz tells us. “But I would sit down to research a trip and eight hours later, an entire Saturday is gone. You can’t find anything,” he says. And he’s right. We live in an age where everything online is going social. Yet travel sites really haven’t. People want advice from their friends, but the most popular sites instead focus on the all-important SEO tactics to make sure that their results rank highly on Google search. That leads to nonsense like this. It leads to sites that couldn’t be any less useful if they tried. Gogobot is all about big visuals and a social component thanks to tight Facebook integration. Know someplace you’re thinking about going? Just enter a question about it on Gogobot and then send it to Facebook. The answers will quickly flow back to you complete with links to all of the places mentioned. Or, at least, that’s Katz’s hope. Obviously, Gogobot is going to suffer from a bit of a chicken-and-the-egg problem. They need to get people using the site first for the social element to work. But that’s where the big beautiful pictures come in. Gogobot crawls Flickr’s creative commons sections to get images for just about every place you can imagine. Katz says that there are already 1.5 million places in their database. That alone could pull people in. So, a friend asks for advice about a certain place and you decide to help them. But instead of sending them a one-time email, why not just fill out a Gogobot review that you can refer others to as well? On services like Yelp, people often write reviews when they’re pissed off about poor service they’ve received. But the Gogobot type of review system — writing reviews because your friends want recommendations — seems to make a lot more sense. And once you figure out the place that you want to go to, adding it to an itinerary is as easy as one click. Katz thinks of Gogobot as sort of a Pandora for travel. With it, you can see all the cool things in a city, but filtered through a lens — in this case, your friends. Most importantly, “it should be fun and it should be fast,” Katz says. And the service allows you to show off where you’ve been around the world with your own digital passport. The other curious thing about a lack of a killer product in the travel discovery space is just how much money there is here. This is a $100 billion a year industry in the U.S. alone. It’s something like $350 billion worldwide. And again, it’s dominated by a bunch of SEO players. 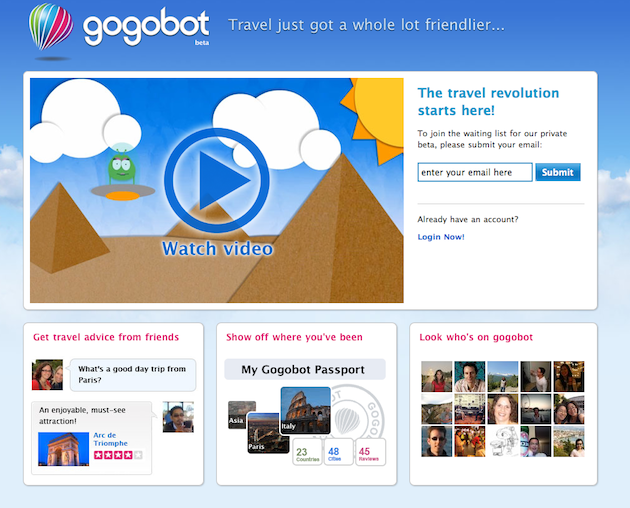 Eventually, Gogobot will make money from online bookings and advertisements. But for right now, they’re just focused on user experience and gaining users. They hope to stay in closed beta for about a month, then they’ll roll out more widely. The service raised $4 million in funding back in June. And while it wasn’t disclosed at the time, Google CEO Eric Schmidt is one of the investors through his private Innovation Endeavors fund. The service was kind enough to give us 5,000 invites to give away to TechCrunch readers. So if you’re interested, sign-up at this link.